Since 2010 we have run hundreds of surveys and interviewed more than 100,000 vets and pet owners across most countries in Europe. Having our own panel means you can cut out the middle man, making your research project much more economical. Vetsbus – Omnibus studies – want to ask just one or two questions, but need a solid sample? Our omnibus is the most robust, and also the best value! Vetsadeval – advertising pre-testing – either using our Vetspulse (2 – 3 day turnaround) or a mode ad-hoc approach, you choose. Vetssyndicated – in an industry where sales force plays a major role, it’s now, more than ever, critical to make sure your sales reps perform and deliver what vets expect. In the UK we run a yearly tracker purchased by most of the largest pharmaceuticals that monitors every aspect of sales representatives’ performance . 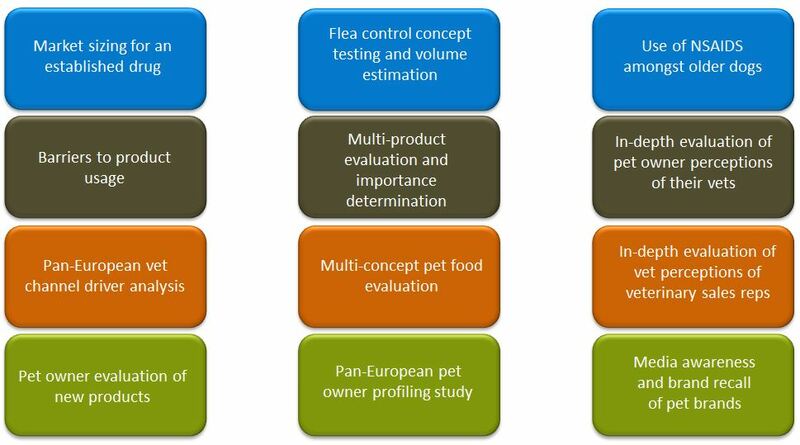 Concept testing – we hold a database of over 120 veterinary product concepts that can be used for benchmarking. Volume estimation and opportunity analysis – we know what questions to ask our vets to deliver the best estimates of potential volume, and what’s more, we can indicate what aspects to improve in any offering to increase volume. Drop us a line to discuss your quantitative projects.